Today, our understanding of the Earth is rapidly increasing in the three dimensions of space, time and structure. The tools of complex system science are disclosing new and interesting dynamics, which have a role to play in sustainable development, orientation, design and implementation processes. For example, it can guide more sustainable uses of renewable resources, which could lead to an important link between resource efficiency and economic growth. In 1972, Donella Meadows and a few other authors presented a book that was titled, ‘The Limits to Growth’. This book described the consequences of a rapidly growing world population and finite resource supplies. It also talked of a system model that linked global economy with the environment. Of the many conclusions made, the most prominent was that limited natural resources must limit human population and economic activity. The global model, presented in the book, was constructed to estimate the future impact of continuous growth under a number of different assumptions. The criticisms of this research arose from the fact that it was misunderstood. As in the case of system models, this one never intended to be able to forecast or be predictive. But, in fact, it was one of the first attempts to understand and explore the behavior of the world’s economic system. The limits to growth can be seen as an early call for the transition to sustainability. In 2004, the authors of the book suggested that economic decline is likely unless measures are taken to limit consumption and population growth, and to increase the efficiency with which materials and energy are used. A few years earlier, with the motive of comparing the model projections with what actually happened since 1972, Turner found that the data, describing trends, over the past 30 years were in sync with the key features of the 'original model.' Keeping with this, a collapse in the global system, midway through the 21st century, seems possible. 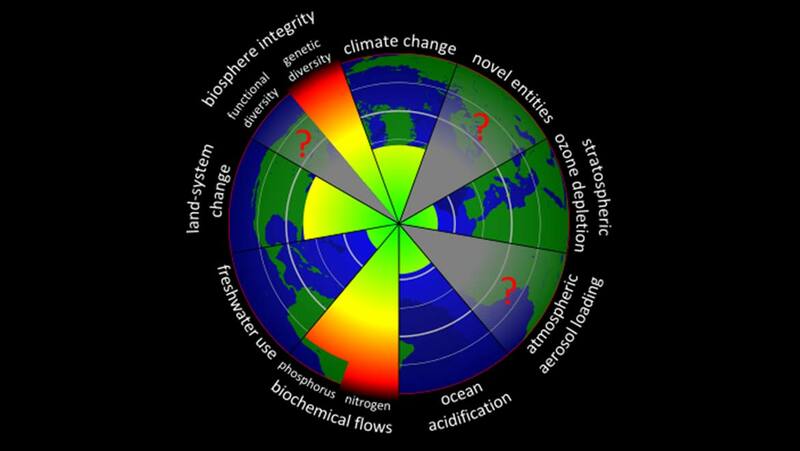 The review also provided some important insights into understanding and controlling global pollution. Davidson in 2000 suggested that continued economic growth does not result in ecological collapse but continuous environmental degradation without clear limit points. To acknowledge these limit points, it was important to understand the consumption patterns along with their deterministic driving factors. It is evident that, currently, humans are consuming more than the Earth system can support, as per the ecological footprint analysis. 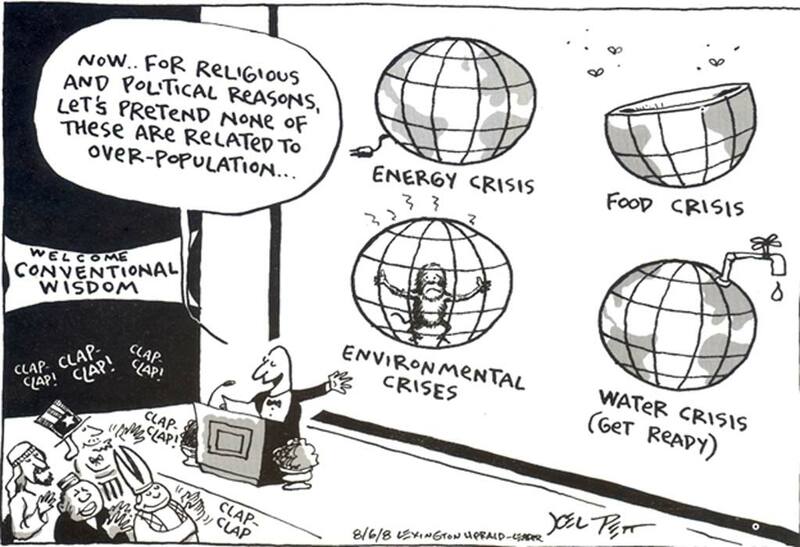 An interesting way to look at this issue would be to think of how much the current global population consumes, which is more than 7 billion. Let us consider the number of animals killed for food worldwide, in a single year: 52 billion hens, 2.6 billion ducks, 1.3 billion pigs, 518 million sheep and 292 million cows. Also, the resources needed to support these animals need to be taken into account. The estimations are, in fact, overwhelming. There are many ways to define, achieve and measure sustainable development. All of these concepts are basically supported by three fundamental dimensions and the evolving flow between them. 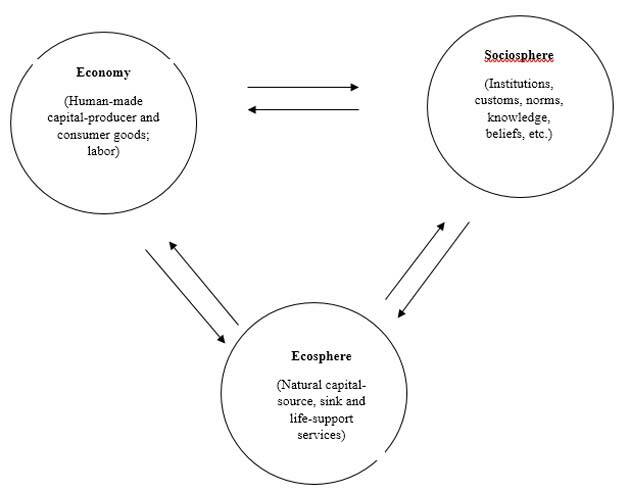 These dimensions can be categorized as ecological/biophysical, psychological, economic and social/cultural. 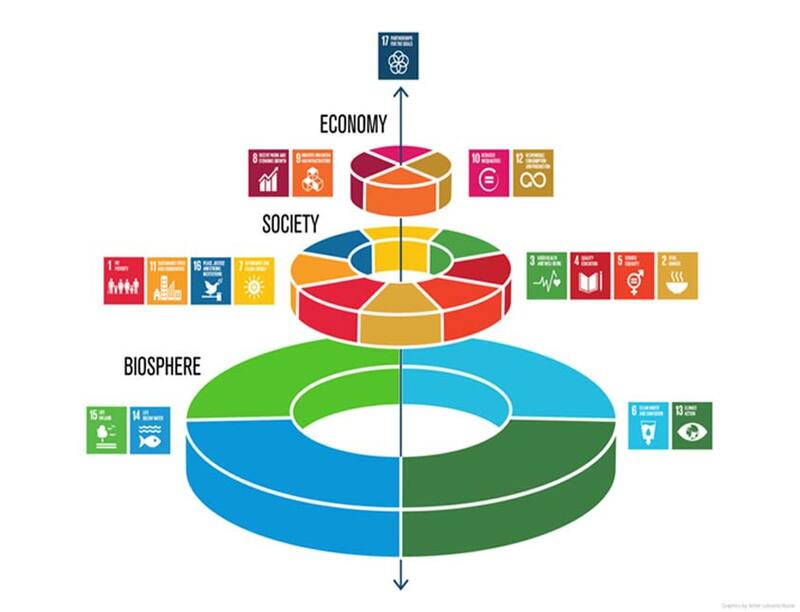 The sustainable development goals are based on the intersections of these dimensions. In 2012, at the Rio+20 Conference, the international community decided to establish a High-level Political Forum on Sustainable Development to subsequently replace the Commission on Sustainable Development. The High-level Political Forum held its first meeting on September 24, 2013. At the Rio+20 Conference, the Member States also decided to launch a process to develop a set of Sustainable Development Goals (SDGs), which were to build upon the Millennium Development Goals and converge with the post-2015 development agenda. The process of arriving at the post-2015 development agenda was Member State-led with broad participation from Major Groups and other civil society stakeholders. On September 25, 2015, the United Nations General Assembly formally adopted the universal, integrated and transformative 2030 Agenda for Sustainable Development, along with a set of 17 Sustainable Development Goals and 169 associated targets. According to the Brundtland Report, sustainability emphasizes the connections between economic productivity, environmental quality, and social equity. The pathways for the integration of these may differ from nation to nation, but they must share certain common traits. There are three main dimensions that sustainability seeks to integrate: economic, environmental, and social (including sociopolitical). Economic interests define the framework for making decisions, the flow financial capital, and the facilitation of commerce, including the knowledge, skills, competencies and other attributes embodied in individuals that are relevant to the economic activity. Environmental aspects recognize the diversity and interdependence within living systems, the goods and services produced by the world's ecosystems, and the impact of human wastes. Socio-political refers to the interactions between institutions, firms, and people, the functions expressive of human values, aspirations, and well-being, ethical issues, and decision-making that depend upon collective action. This is also known as the ‘Triple Bottom Line’ model, which was officially endorsed by the UN in 2007, also referred to as People, Profit, and Planet. Humanity definitely faces the challenge of achieving a high quality of life for over 7 billion people, without destabilizing critical planetary processes. Physical needs such as nutrition, sanitation, access to electricity and the elimination of extreme poverty could likely be met for every human, without transgressing planetary boundaries. However, the universal achievement of more qualitative goals (for example, high life satisfaction) would require a level of resource-use that is 2 to 6 times the sustainable level, based on current relationships. Strategies to improve physical and social provisioning systems, with a focus on sufficiency and equity, have the potential to move nations towards sustainability. But, the challenge remains substantial. Meadows, D. H., Meadows, D. D., Randers, J. and Behrens, W. W. (1972). The limits to growth, Universe Books, New York. Cole, M. A. (1999). Limits to growth, sustainable development Kuznets curves: an examination of the environmental impact of economic development. Sustainable Development, 7:87-97. Meadows D. H., Randers, J. and Meadows, D. L. (2004). The Limits to Growth: The 30-year Update, Earthscan, London. Turner, G. (2008). A comparison of The Limits to Growth with thirty years of reality: socio-economics and the environment in discussion (SEED). CSIRO Working Paper Series Number 2008-09. Atkisson, A. 2010. Believing Cassandra: How to be an Optimistic in a Pessimist’s World, Earthscan, Oxford. Davidson, C. 2000. Economic growth and the environment: alternatives to the limits paradigm. BioScience, 50: 433-440. FAO 2013. FAOSTAT, Food and Agriculture Organization of the United Nations: Rome. WBCSD 2008. Sustainable Consumption Facts and Trends from a Business Perspective, World Business Council for Sustainable Development (WBCSD), Geneva.